A gallon of paint can cost as little as $15 or well over $100. What’s the difference? The paint can labels are not very informative. Many companies don’t list their ingredients. Even when they do, you have to be a chemist to understand them. For most people, the only indicator of quality is the price. If you want to know why a $60-a-gallon paint performs better than the $15-a-gallon stuff, you have to ask questions. From the time the cave murals in France were made, about 30,000 years ago, paint has had three primary components: pigments, binder, and solvent. The pigments, usually ground into powder, provide the color. The binder is the glue that holds the pigment particles together and to the wall. The solvent is the liquid in which the binder and pigment are mixed so that they can be applied to a wall. When the solvent dries, a thin, colored film remains. The cave muralists used powdered pigments made from minerals and charcoal. Their binder was animal fat, their solvent water. Today some pigments are still made from minerals, but most are synthetic compounds. For latex, the most commonly used interior house paint, the binder is a synthetic resin, but the solvent is still water. Although some paint companies might suggest that the water from a nearby mineral spring enhances their product, all water used in today’s latex paints is essentially the same. The variables that determine quality and price are the binders and pigments. At first, both the cheap and the expensive paints will look beautiful. The more expensive ones may offer more color choices, but most paint manufacturers offer more than enough for most people. The differences begin to emerge after the job is finished and you start using the space. No matter how conscientious you are, the walls will get dirty. There will be smudges around the light switches, those stray bits of mustard that went everywhere when you tried to squeeze the last drop out of the bottle, and those dirty little splatters from your dog shaking off rain before you could grab a towel. In 10 years, the $60-a-gallon wall, which can be cleaned, will still look good. The $15-a-gallon one may have been repainted three times because when you tried to clean it, the color came off or the stain couldn’t be removed. How do the binders and pigments produce these results? Latex paints at both ends of the price spectrum have a white pigment base to which colorants are added. At the low end, the white pigment is made of titanium dioxide with clay, calcium carbonate (commonly called chalk) or some other inexpensive filler. It can have good “hide”, and completely obscure whatever was on the wall before, but it wears off easily, as you will discover if you accidentally rub up against it or try to clean it. At the high end, the pigment will be made entirely of titanium dioxide, which is much more durable but much more expensive. Titanium dioxide also reflects light better; to the discerning eye, the color looks brighter and more vibrant. Latex binders at the high end are made of pure acrylic, which adheres well and holds the pigment particles tightly against the wall. The labels of the cheaper paints may say “latex acrylic,” but the binder is mostly or entirely vinyl acrylic, which does not adhere as well. The most inexpensive paints use less binder, so they adhere even more poorly. Within the categories of pigments and binders, there are gradations of quality. The acrylic binders in the most expensive paints will be more finely ground and more tightly packed, which makes the paint more stain-resistant and better adhering. Darker colors can be problematic at every price because their production requires less pigment base and more colorant. As a result, the finished paint film will be soft, with less staying power. When you try to remove a spot, you may leave burnish marks, and some color may come off. The problem lies in the colorants, which were initially formulated to be used with oil-based paints. 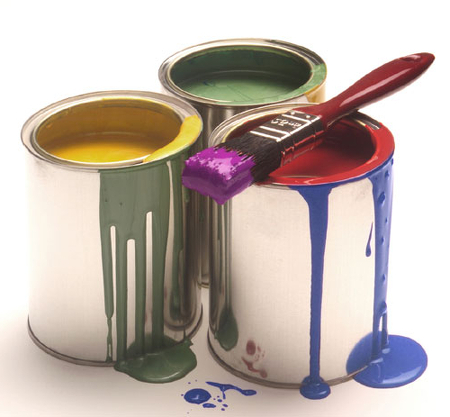 These paints, once a staple, are not commonly used anymore in many areas for environmental reasons. Benjamin Moore’s new $60-a-gallon Aura line claims to have solved this problem with a new colorant system that was formulated to be used with water-based paint. The distinctions between binders, pigments and dyes are not the ones that you are likely to hear when you go to buy paint. The differences emphasized by most salespeople are the finishes — flat, eggshell and satin. Those are produced by using different sizes of pigment and binder particles. A cheaper satin is more impervious than a cheaper flat, but the pricey flat will perform better than either of the cheap ones. In kitchens and bathrooms, where there will most certainly be water and dirt, you are always advised to use a more impermeable eggshell or satin, even with the $60-a-gallon paint. The salespeople may also talk about “coverage” — the area of the wall that a gallon will cover. The industry average is 400 square feet, but the most expensive paints can cover more area, so you may need fewer gallons to do the job. Frankly speaking, while choosing for paint there are less factors upon which one can judge the quality of the paint. Because for a non technical person, it is difficult to understand the technical terms to come up with the conclusions. But the blog can be really helpful in this regard. Next time, whenever I go to choose a paint, I will judge it on the factors mentioned here. Nice piece of writing. Great work!! Choosing a good quality of paint is not an easy task even I’ve faced this problem many times. Your blog is really very helpful and informative for me. Thanks a lot for taking the time to write it and post it! Fantastic items from you, man. I have remember your stuff previous to and you are just extremely wonderful. I actually like what you have acquired here, certainly like what you’re stating and the way in which during which you assert it. You’re making it entertaining and you still care for to keep it wise. I can not wait to learn much more from you. That is really a tremendous site.